Today is (the moon permitting) Eid al-Adha or, as it's known in Africa, Tabaski. I think the last time that the three Abrahamic religions had holidays around the same period was in 2000. MoBob is organizing a dinner this evening with a friend from the same region of Morocco. He claims no goats or sheep will be harmed in this process, but it does mean a road trip to the outer suburbs to the hallal grocery store. 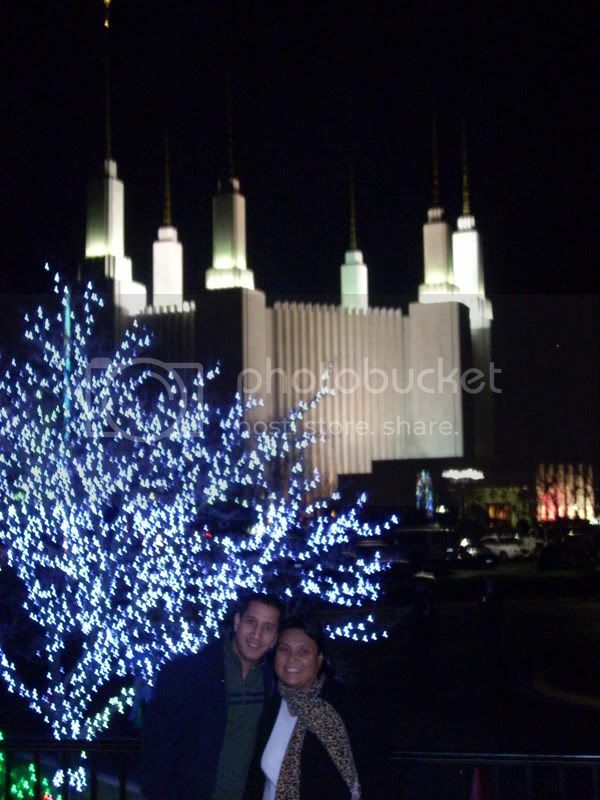 Last Friday JMK kindly took us to see the Festival of Lights at the Washington DC Temple. Okay, I guess you weren't wearing your hat that night. Hm. Did you find it? This picture of the two of you turned out great! Thank goodness that nine foot tall missionary was there to snap it! No, you don't. You have natural, healthy, good looks. Thanks! I just want to look, I don't know, more polished and professional I guess. Like an adult. Any advice? None! Looking more polished and professional has always been my goal too, but it just doesn't really work out that way for me. I've been wearing nice-fitting pants from The Gap or Banana Republic which makes me feel more professional, but it still doesn't stop people in my office from assuming that I'm support staff rather than an attorney. I guess I have the same problem - overseas I'm always mistaken for a Peace Corps volunteer, and here as a grad student! It's probably because of our youthful good looks. (that's what BKL tells me at least). I don't think that you really need help. Think that you look pretty cute actually.